This is an Icelandic name. The last name is patronymic, not a family name; this person is referred to by the given name Jón Páll. 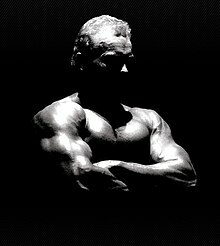 Jón Páll Sigmarsson (28 April 1960 – 16 January 1993) was an Icelandic strongman, powerlifter and bodybuilder who was the first man to win the World's Strongest Man four times. He is regarded as one of the greatest strongmen of all time, and is credited with developing Iceland's national identity. He was named Icelandic Sportsperson of the Year in 1981, and was one of the best-known Icelandic athletes. In 2012, Jón Páll was inducted into the World's Strongest Man Hall of Fame. Jón Páll was born in Hafnarfjörður on 28 April 1960, weighing 4 kilograms (8.8 lb) and measuring 52 centimetres (20 in). He was the first child of Dóra Jónsdóttir and Sigmar Jónsson. He was raised by his mother and foster father Sveinn Guðmundsson. The family moved to Stykkishólmur when he was two. He remained there until the age of nine, when the family relocated to Reykjavík. Growing up, he spent his summers on Skáleyjar and was active as a farmhand. He worked from dawn until dusk, carrying pails of water and assisting his foster father on seal hunts. He took up Glima, a traditional Icelandic form of wrestling, at the age of five and later played football and handball, as well as competing in swimming, middle-distance running, and karate. Jón Páll was introduced to weight lifting in 1976, and began training at Jakaból in 1978. In 1984 he won the Icelandic bodybuilding title in the +90 kg. class. His achievements in powerlifting also include Icelandic records in the bench press (with 192.5 kg (424 lb), 195 kg (430 lb), 210 kg (463 lb) and 222.5 kg (491 lb)) and the squat (with 320.5 kg (707 lb), 330 kg (728 lb), 342.5 kg (755 lb) and 357.5 kg (788 lb)), but his best performances were usually in the deadlift event, in which he set the European record many times (with 350 kg (772 lb), 352.5 kg (777 lb), 360 kg (794 lb), 362.5 kg (799 lb) and 370 kg (816 lb)) and multiple world records in strongman competition deadlift variations, such as the rectangular handled wheel and one handed deadlift. Jón Páll was invited to the World's Strongest Man competition for the first time in 1983, in which he came in second only to Geoff Capes. The following year, at age 24, he defeated Capes and secured the title. During the final armwrestling event, in which Jón Páll was up against him, Capes appeared to be winning, pulling Jón Páll's arm down convincingly, but sustained a muscle tear in his forearm as Jón Páll started to thrust his arm back. Right after winning the bout, Jón Páll shouted "The King has lost his crown!" and won his first World's Strongest Man title in 1984. Although Jón Páll was closely defeated by Capes at the 1985 World's Strongest Man, he managed to regain the title in 1986. During the deadlift event at the 1985 World's Strongest Man competition, someone in the audience called him an Eskimo. Jón Páll shouted back: "I am not an Eskimo. I am a Viking!" and successfully lifted the 495 kg (1,091 lb) cart. In 1986, Jón Páll first wrestled English author and Guinness World Record Holder Brian Sterling-Vete in a demonstration match for the TV news and print media held at Finnur Karlsson’s gymnasium in Reykjavík, Iceland. Halfway through the match Jón and Sterling had plotted to surprise the audience with a supposed angry outburst leading to the two of them demonstrating their skills as martial artists. This showmanship became synonymous with both Jón Páll and Sterling. In 1987, Jón Páll clashed with his arguably greatest rival - 3 times World's Strongest Man winner Bill Kazmaier of Burlington, Wisconsin, USA, who had not been invited to compete at World's Strongest Man again after winning the competition 3 times in a row from 1980 to 1982. Kazmaier boasted some of the heaviest powerlifting lifts of that time including world records in the bench press with 300 kg (661 lb), deadlift with 402.5 kg (887 lb) and total 1,100 kg (2,425 lb) and had made his reputation in the 1980s as "the strongest man who ever lived" by breaking numerous strongman world records. At Pure Strength 1987, a competition held in place of the absent World's Strongest Man competition of that year on the grounds of Huntly Castle in Aberdeenshire, Scotland, Geoff Capes, Bill Kazmaier and Jón Páll matched up to crown the strongest man on the planet. Jón Páll, being in the shape of his life, won the contest convincingly by winning 8 out of 10 events and even managed to beat Kazmaier, who was making his comeback into the strongman sport after having worked and travelled as a professional wrestler. A famous quote, "There is no reason to be alive if you can't do deadlift." was shouted by Jón Páll when he won the deadlift event at this contest with a strongman world record lift of 523 kg (1,153 lb) off a rectangular handled bar from knee height. At the 1988 World's Strongest Man the two rivals clashed again. As expected Kazmaier dominated the static events while Jón Páll, who had shed body-weight to cater for all the dynamic tests of strength of World's Strongest Man instead of the latter statically orientated events of Pure Strength 1987, was often victorious in the more athletic, speed- and endurance-oriented events. Although Jón Páll was beaten by Kazmaier in the deadlift, log lift and sack race, he managed to win the "weight over the bar event" and the McGlashen Stones in the end to secure the overall victory and to become the World's Strongest Man for the third time equaling Kazmaier's record. After his victory Jón Páll said: "I may be the fastest strongman in the world, but I think Bill [Kazmaier] is the strongest on his feet." After a disappointing third place at the 1989 World's Strongest Man, Jón Páll was able to win the competition, while injured, for a record breaking fourth time in 1990. O.D. Wilson, who was leading the competition with a comfortable 5½ points before the last event (a 200 m race with a 100 kg weight on the back), weighed 180 kg (397 lb) and lacked the endurance and running speed to complete the course quickly enough and ended up losing by half a point to the much lighter and faster Jón Páll. The 1990 World's Strongest Man proved to be Jón Páll's last appearance on the World's Strongest Man stage, as he was surpassed as the Icelandic number one by fellow countryman Magnús Ver Magnússon, who won the Iceland's Strongest Man title in 1988 and 1989 and continued Sigmarsson's legacy by emulating his 4 World's Strongest Man title wins during the 90's. Two other famous quotes of Jón Páll's are "I am in seventh heaven", which was his translation of an Icelandic saying, and "Ekkert mál fyrir Jón Pál", which translates as "No problem for Jón Páll". Jón Páll remained an icon for the Strongman sport. His charm and charisma off stage made him a crowd favourite and his supreme strength was manifested in his infamous and exuberant Viking chanted performances on stage. With four Worlds Strongest Man titles, Jón Páll Sigmarsson is one of the five most successful competitors in the history of the contest. He is only equaled by Magnús Ver Magnússon, Žydrūnas Savickas, and Brian Shaw with four titles and surpassed by Mariusz Pudzianowski with five titles. Jón Páll was also one of a few strongmen who possessed the genetics that allowed him to master all forms of strength. He was able to master the Olympic weightlifting lifts as well as exert tremendous static strength that allowed him to defeat some of the greatest powerlifters of all time. This combination of strength manifested well in World's Strongest Man, leaving no chinks in his armour. Coupled with strength training he also achieved feats in the Bodybuilding world. This included his famous bodybuilding and strongman wins in 1988, where he had to contrast his heavy strongman training and bulk of up to 140 kg (309 lb) with a cutting up phase to 110 kg (243 lb) for the bodybuilding contests. His weight remained consistently around 130 kg (287 lb) for the World Strongest Man contests, where versatility would be compromised by heavy bodyweights, a point emphasized by Ab Wolders of the Netherlands in 1989, a fellow competitor. Jón Páll weighed his heaviest during Pure Strength 1987 at a weight of 143 kg (315 lb). Jón Páll was namechecked in Iceland's entry to the Eurovision Song Contest 1988, "Sókrates" by Sverrir Stormsker. He was also shown, among the artists competing, in a short videoclip at the opening of the Contest. Compere at the Contest, Pat Kenny, claimed he was brought along by the Icelandic delegation for reasons of security. Hjalti Árnason, a lifelong friend of Jón Páll's, created the Jón Páll Sigmarsson Classic international strongman contest in 2010 in honor of Jón Páll. The event is held annually during the Icelandic fitness & health expo in Reykjavík, the inaugural winner was America's Brian Shaw in 2010. Jón Páll was described in his life documentary "Larger than Life" by one of his former rivals Geoff Capes as "a new kind of guy on the block" and by David Webster equally in describing him as a man who boasted pure static strength as well as versatile athletic strength in all its forms, a combination that lead to his supreme performances. After battling with the injuries sustained during 1988, 1989, and 1990, which had affected his athleticism, his strength became progressively more static in his later years. Jon Pall was often challenged by fellow competitor Bill Kazmaier in feats of statically oriented events between contests because he believed the events were biased in Jón Páll's favour. This included Kaz challenging Jon Pall to a sledgehammer hold during Pure Strength 1987 where Jón Páll beat Kazmaier. Kazmaier had travelled to Nigeria for a strength exhibition with Douglas Edmunds to break the deadlift world record by deadlifting 414 kg (913 lb) with straps, Jon Pall then re-broke the record with a lift of 427.5 kg (942 lb) in his gym in Iceland in front of spectators in 1987 at his heaviest bodyweight in preparation for Pure Strength 1987. Although he was known for his energetic and boastful personality when competing, Jón Páll was a soft-spoken and bookish man in his personal life. Jón Páll had one son, Sigmar Freyr (born 1983). On 16 January 1993, Jón Páll died of an aortic rupture while deadlifting in his gym, Gym 80 in Reykjavík. This was likely the result of a congenital heart defect that affected other members of his family, which was exacerbated by his use of anabolic steroids. He had sought medical treatment in the United States the previous year due to heart problems and Sölvi Tryggvason in his 2013 biography of Jón Páll stated he suspected Jón Páll knew he was close to death. Rectangular-handled wheel Deadlift - 523 kg (1,153 lb) - Pure Strength 1987, a strongman world record in 1987. Log Lift - 165 kg (364 lb) - Iceland's Strongest Man 1987, a strongman world record in 1987. He also achieved world records in the Claymore Lift, McGlashen Stones and the Cannon Pull during Pure Strength 1987. He was also the first man ever to load a 150 kg (331 lb) McGlashen stone and got into the Guinness Book of Records for lifting the world's largest whiskey bottle. Bench Press - 250 kg (551 lb) raw. Deadlift - 400 kg (882 lb) raw as an exhibition lift in 1986. Deadlift - 427.5 kg (942 lb) with wrist straps as an exhibition lift. Squat - 390 kg (860 lb) raw. ^ a b c "Sigmarsson Jón Páll". allpowerlifting.com. Retrieved 6 May 2015. ^ a b "Sigmarsson Jón Páll". allpowerlifting.com. Retrieved 6 May 2015. ^ a b David Horne (7 May 2010). "David Horne's World of Grip". David Horne. Retrieved 7 May 2010. ^ "The Top Ten World's Strongest Men of All-Time". World's Strongest Man. Archived from the original on 28 October 2011. ^ a b Símon Birgisson (7 December 2013). "Heldur rýr Jón Páll". Vísir (in Icelandic). ^ Staff writer(s) (26 January 1993). "Jón Páll Sigmarsson - viðbót Hann fæddist á Sólvangi í Hafnarfirði hinn 28". Morgunblaðið (in Icelandic). ^ a b c Kári Elíson (27 January 1993). "Jón Páll Sigmarsson - viðbót Harmur berst um hyggjusvið. Sorg og tómleiki". Morgunblaðið (in Icelandic). ^ a b Staff writer(s) (19 January 1993). "Jón Páll Sigmarsson látinn". Morgunblaðið (in Icelandic). ^ a b Odegard, Alana (30 January 2014). "A Tribute to Iceland's Gentle Giant: Larger than Life". Iceland Review. ^ a b c d e f g "Jon-Pall Sigmarsson Tribute Page". earthlink.net. Retrieved 6 May 2015. ^ "1987 Pure Strength Contest". billhenderson.org. Retrieved 6 May 2015. ^ a b "Brian Shaw Wins the Inaugural Jon Pall Sigmarsson Classic Strongman Contest". ironmind.com. Retrieved 6 May 2015. ^ "Jakabol: Magnus Ver Magnusson Launches New Gym". ironmind.com. Retrieved 6 May 2015. ^ a b "The Giants of Iceland | Strength Beyond Measure". ^ "Jón Páll vissi hann væri að deyja". ^ a b c d e f "WSM Records". billhenderson.org. Retrieved 6 May 2015. ^ a b "World's Strongest Man - Season 11, Episode 1: Pure Strength 1987 - TV.com". TV.com. CBS Interactive. Retrieved 6 May 2015. This page was last edited on 16 April 2019, at 03:56 (UTC).